Family and friends will finally lay Summer Shipp to rest, more than three years after she disappeared. A small gathering attended the burial at Livingston Cemetery in Iberia, MO. Click here to read the Kansas City Star Obituary or sign the guestbook. March 13 - 16, 2008 The CUE CENTER FOR MISSING PERSONS held their 4th annual National Round Table Conference for Missing Persons in Wilmington, NC. All my thanks to Monica Caison and the crew for an empowering three days. They honored Summer Shipp along with two other recovered missing persons at the Waterfront Candlelight Vigil. The CUE CENTER FOR MISSING PERSONS held their 4th annual National Round Table Conference for Missing Persons in Wilmington, NC. Brandy was honored to speak of Summer Shipp at the Vigil. Click here to see Brandy's Tribute to her Mother. For more details, click C.U.E. Center Conference. October 27, 2007 CELEBRATION OF LIFE" MEMORIAL SERVICE Butch and Marti Rigby allowed us to use Screenland Theatre, 1656 Washington, KC, MO for a gathering to remember my mother. Speakers included Alvin Brooks, Chief Fred Mills, Reverand Sam Mann, Jan Marcason, and songs by David Basse and Ida McBeth. Brandy Shipp and Summer's brother Danny McCullough also spoke. October 7, 2007 REMAINS FOUND IN LITTLE BLUE RIVER Fishermen found the remains, positively identified as Summer, Shipp, in the Little Blue River near Highways 78 and 7 about 8 miles from where she disapppeared. Some clothing was also found wrapped in fishing line. 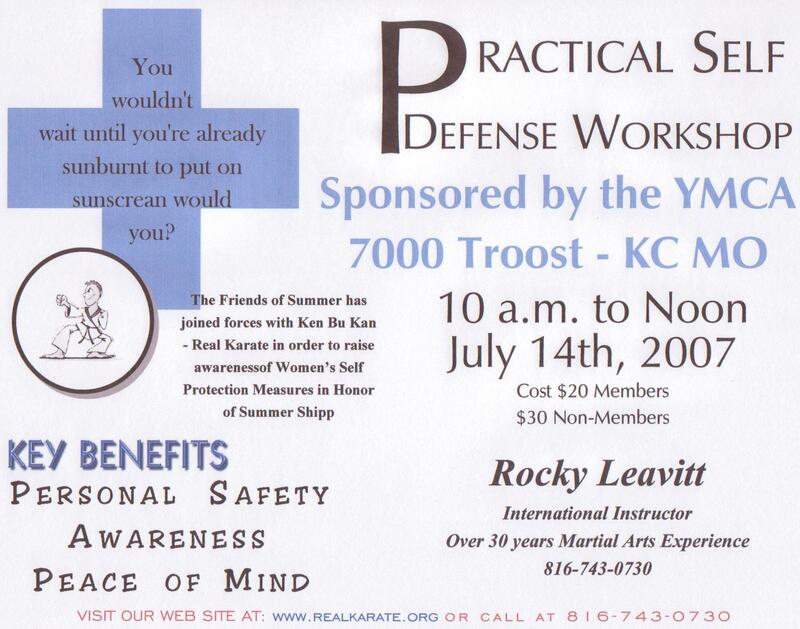 July 14, 2007 SELF-DEFENSE WORKSHOP "Ken Bu Kan-Real Karate" (www.realkarate.org) has joined forces with "The Friends of Summer" Organization and conducted a self-defense workshop on Saturday, July 14 from 10:00 a.m. to noon at the YMCA, 7000 Troost, KC, MO. To see the flyer, click Flyer for self defense event. June 14, 2007 CUE CENTER HOLDS 4TH ANNUAL "ROAD TO REMEMBER" TOUR RALLY STOP at 47th and Main in Kansas City, MO @ 5:00 - 6:00 p.m. The Rally Stop had a great turn-out and the KC Star and all 4 TV networks helped raise public awareness of many missing persons cases. The CUE Center, and founder Monica Caison, www.ncmissingpersons.org visited 11 States, making various stops in each over 10 days, to feature missing persons cases which have faded from the Media. This was to bring new light to many old cases. This stop featured missing persons: Shirley McKoewn, Sam and Lindsey Porter, Jody Ledkins, Jon Van Dyke, Summer Shipp, and Kara Kopetsky. April 3, 2007 HEARING SCHEDULED FOR NOON The "Summer Shipp Act" (HOUSE BILL #757) was heard in front of the House Judiciary Committee in Jefferson City, MO, Hearing Room 1. This hearing was open to the public. March , 2007 The CUE CENTER FOR MISSING PERSONS held their annual National Round Table Conference. Brandy was a guest speaker for Kelly Jolkowski, www.projectjason.com, regarding the new model legislation we are trying to pass on a state level. There were training sessions and discussions of techniques for searching for missing loved ones. The conference was held in Wilmington, North Carolina. For more information about the conference click here. December 9 & 10, 2006 ACHIEVE FOUNDATION AND FRIENDS OF SUMMER. Too often, women become the victims of violence because they have not been taught how to defend themselves. Many times, a small amount of training is all that is necessary to prevent some of the tragedies that befall women in vulnerable situations. Whether the danger comes from men or from women meaning harm to hapless victims, knowledge of self-defense can make an immediate difference and change the outcome of otherwise tragic circumstances. Friends of Summer has decided to join forces with Achieve Foundation in order to raise awareness of Women's Self Protection Measures in Honor of Summer Shipp. If just one woman can benefit from the kind of knowledge and self-defense skills that can be acquired from proper training, this combined effort will be worth it. Please check with Achieve Foundation's website at http://www.achievefoundation.com for more information. "Friends of Summer" and "Achieve Foundation" held training classes on December 9&10, 2006, which was the two year anniversary since Summer's disappearance. The workshop was held between 8 a.m. and 1 p.m. each day. Butch and Marti Rigby were very generous to offer space at Screenland (17th and Washington, KC MO) for the training. Please check back with this website and with Achieve Foundation for more information as it becomes available for future events. You can watch coverage of the Self-Defense Training with Achieve Foundation by clicking here. October 27, 2006 THE SQUEAKY WHEEL WORLD WIDE TOUR was at the Grand Emporium Click here for details. Sept. 29, 2006 KANSAS CITY STAR ARTICLE concerning local missing persons. June 2006, FLYER IN "EYE ON INDEPENDENCE" Summer Shipp's case still is in the hearts and minds of the people of Kansas City and Independence. A flyer of information concerning my mother's disappearance was printed in local monthly guide entitled "Eye on Independence." 7,500 copies of the paper including the information on Summer were distributed at 60 locations in Independence. Thanks to Craig Mosher for his interest in including the flyer in his publication! Hopefully, someone who sees the paper and may know something will come forward or call (816) 474-TIPS. March 24-26, 2006 The CUE Center FOR MISSING PERSONS held their annual National Round Table Conference. There were training sessions and techniques for searching for missing loved ones were discussed. The conference was held in Wilmington, North Carolina and received much National Attention. For more information about the conference click here. February 4, 11, 18 & 25 As a CONTINUING EFFORT to raise community awareness of the unsolved homicides and missing persons cases in Kansas City and the surrounding areas, Alonzo Washington organized an activity called the "Corner of Hope." Family members and others interested in helping with this effort met in the Osco parking lot at 63rd and Prospect at Feb, 4, 11, 18, & 25th at 3:00pm. In order to get the most information to those receiving the flyers, we made a flyer which lists six of the cases. The flyer can be downloaded by clicking here. February 4, 2006 CORNER OF HOPE Alonzo Washington, community activists and publisher of the Omega Man Comic Books, has been trying to bring attention to all the unsolved homicides in our area. Alonzo organized relatives of homicide victims or missing people to hand out flyers at the corner of 63rd & Prospect at 3:00 PM Saturday the 4th of February and the activity will continue every Saturday for the month of February. He hopes this will make the community want to come forward with information about these various homicides. Man Resurfaces in Court by Kevin Hoffman and Mark Morris of the Kansas City Star. December 22, 2005 THE NANCY GRACE SHOW on CNN once again featured the Summer Shipp case and Brandy was asked about the "former person of interest" and his incarceration might mean for the case. Brandy said that it may encourage anyone who knows something about her mother's disappearance to come forward now that this "former person of interest" is no longer on the streets. December 22, 2005 "FORMER PERSON OF INTEREST" appeared before a Federal Court in a hearing to determine whether his parole will be revoked. The hearing took place at the Federal Courthouse in downtown Kansas City at 10am on the 7th floor in Judge Maughmer's courtroom. The "former person of interest" waived his right to a hearing and will appear once again in January to hear what the consequences will be. December 15, 2005 FEDERAL AGENTS ARREST "FORMER PERSON OF INTEREST" at his home. He is being held without bond and is in the process of having his parole revoked. December 14, 2005 THE NANCY GRACE SHOW on CNN featured the Summer Shipp case and Brandy was asked about the person of interest in the case. Brandy replied that this person is a "Danger to Society" and has done things which should have constituted violation of his federal parole in her opinion. November, 2005 VIACOM BILLBOARD MOVED They have once again moved a Billboard to another great location. It can now be seen when driving southbound on I-35 from northeast Downtown KC, MO. September 1, 2005 The "MONTEL WILLIAMS SHOW" aired (4th Re-Run!) my Mother's Story. The exposure is wonderful, please let them know that ! August 24, 2005 Brandy was a Guest Speaker at the KANSAS CITY URBAN CORE GROUP Monthly Event to speak about her Mother's Disappearance and what is being done. August 2005 VIACOM BILLBOARD MOVED They have once again moved a Billboard to another great location. It can now be seen when driving westbound on I-70 just East of Downtown KC, MO. July 16, 2005 Brandy was a Guest Speaker at a Vigil for Kimberly Langwell in Beaumont, Texas, for AMALP Foundation Ministry. Click here for Vigil Photos. July 4, 2005 VALENTINE NEIGHBORHOOD 4TH OF JULY PARADE. Brandy walks and talks with Congressman Emmanuel Cleaver about Summer Shipp's disappearance. Click here for photos and more information. June 20, 2005 "AMERICA'S MOST WANTED" listed Summer Shipp on the 'Missing Person' Database! Click here for details and let's encourage AMW to air her story! May 25, 2005: Thank you, Monica Caison, for the opportunity to speak at The Cue Center 11th ANNUAL WATERFRONT VIGIL to honor Missing Persons, held in Wilmington, North Carolina. Pictures to be posted soon. Click here to read the News Article. Click here for details on the CUE CENTER. May 21, 2005: THE INDEPENDENCE EXAMINER featured a COVER STORY about the progress of my Mother's Case. May 13, 2005: RUSS JOHNSON, KMBZ 980 A.M. RADIO Thank you for having me on your show @ 5:00 p.m.to discuss The Pitch Story. May 12, 2005:THE PITCH featured My Mother's Disappearance for their Cover Story. Kendrick Blackwood presented many additional facts not previously known by most of the public. Click here to read. Click here to send your comments to The Pitch. The Billboard which was on the East side of Southbound I-435 Hwy near the 23rd Steet Exit was moved to face the Northbound traffic. May 9, 2005: ACTION NEWS NBC KSHB-41 Thank you Chris Hernandez, for the informative update on the different views shown by many individuals about how the case is being handled. May 5, 2005: HOT TALK RADIO 1510 KCTE Thank you to Executive Producer Bob Dusselier and Host Chris, for having me on the Stigall Program on Hot Talk 1510 KCTE @ 4:30 p.m.! May 1, 2005: VIGIL -SO MANY TRULY CARE Thank you to all that showed their support at this Vigil which marks the fifth month of my Mothers Disappearance. Click here to see Coverage of Vigil. Click here to see photos of Vigil. Click here to read details. May 1, 2005:CHRIS HERNANDEZ, ACTION NEWS KSHB-TV 41 Thank You for the opportunity to discuss my Mother's Disappearance for your 'special programming', which will air Monday, May 9 @ 10:00 p.m.
April 20, 2005:MALCOLM GARCIA, KC STAR,wrote a very touching story. Click here to read. was so thoughtful to interview me about my mother's disappearance and how it has affected so many people. His column is in the KC Star CITY section 'insert' every Wednesday. The Billboard which was on Northbound I-435 near the Truman Road Exit was moved to the East side of Southbound I-435 Hwy near 23rd Street. If you wrote a letter to the "Friends of Summer" P.O. Box, I am asking you to please contact us again with an exact address or any other follow-up information. Letters were sent during the end of March, indicating Summer had been seen at a residence on the same Street in Independence, MO. Click on UPTOWN BENEFIT POSTER for details. JT Quick @ HOT 103 JAMZ! All of which were so kind to have me as a guest on their radio shows! March 16, 2005: To clear any confusion, the person arrested last week on charges not related to my mother's abduction, has been released. The Independence Police Dep't stated that he is NOT a "PERSON OF INTEREST" nor a "SUSPECT" in this case. March 1, 2005: "THE MONTEL WILLIAMS SHOW" taping went great! The show will feature my mother's disappearance along with four other 'vanished' stories. It will air in the month of April on FOX TV. The exact date has not yet been determined.. I cannot express in words how thankful I am to all of you who helped out. We had a terrific turnout with around 100 volunteers, along with Missouri Investigation, Inc., American Medical Response, the trained K-9's, several Retired Police Officers, Firefighters, and EMT's, as well as many others. My thanks goes out to all who helped make this possible. Without your help, this evidence may have never surfaced ! The Billboard which was on Southbound I-35 just South of Downtown KC was moved to 71 Hwy near 23rd Street. Feb. 18, 2005: GREAT NATIONAL COVERAGE TO COME!!!! My Mother's Disappearance will be featured on the 'Montel Williams Show'in March or April! I will be one of five guests on this 'Vanished Persons' segment. with many, many thanks going to all those who helped post fliers that afternoon. The show was taped the first week of March in NYC. The date to be aired will be determined after taping. Feb. 14, 2005: VALENTINE NEIGHBORHOOD ASSOCIATION HONORS "FRIEND OF SUMMER"
We extend our thanks to the Valentine Neighborhood Association, who presented a 'Love Award' to the "Friends of Summer". . ."We are amazed by their unlimited energy and their positive attitude as they continue the search," President Kevin Klinkenberg said. Feb. 14, 2005: LEE'S SUMMIT UNDERWATER RESCUE & RECOVERY, INC.
A large area of Blue Springs Lake was searched by the Independence Police with the help of this group, which consists completely of volunteers. They have been a tremendous help recently in searching area lakes for clues, following leads and tips received. Any donations to them will help us in our future needs for their services. Feb. 1, 2005: FOX 4 NEWS REPORTER PETER MARSHALLstopped by the 'Friends of Summer Headquarters' and requested "A Day in the Life" of Brandy's ongoing effort to find Summer! There was a very touching report on the evening news. We extend our thanks to all of the WDAF TV 4 NEWS TEAM!! went up with Summer's picture and contact information. This billboard space was donated by Viacom and is located on I-35 around 21st street downtown and can be seen if driving south. The first billboard, space donated by Lamar, is located on southbound I-435 near the Truman road exit. Jan. 24, 2005: DO YOU HAVE ANY TIPS, LEADS, OR INFORMATION? The Shipp Family has set up a special postoffice box so that anyone out there with any tips, leads, or information about the disappearance of Summer Shipp can contact the family directly and even anonymously if desired. Or, if you prefer, you can always contact the Move Up secret witness program at (816)753-1111 or the TIPS hotline at (816) 474-TIPS. You can always remain anonymous. Jan. 13, 2005: THE MOVIE BENEFIT FOR"FRIENDS OF SUMMER"
was quite a success raising over $7,500 ! Butch and Marti Rigby hosted a screening of the movie "The Triplets of Belleville" at which over 200 people showed up. In the Valentine Neighborhood where Summer lives, the residents gather every Christmas eve to line the streets with candles and spend a few minutes with their families and neighbors. This year, the lumanaria lighting was dedicated to Summer’s safe return. They gathered to fill lumanaria bags on Friday at Bob Magaha and Mike Jone's house at 620 Valentine. At dusk they returned to light the candles and celebrated the beauty of their neighborhood. All of Summer’s family and friends were invited to join. Brandy Shipp said all she wants for Christmas is the safe return of her mother, Summer, who disappeared over two weeks ago. Summer Shipp was last seen in Independence, where she had gone to do door-to-door canvassing for her market research job. “We’re doing everything we can to get her back before the holidays,” Brandy said. Friends of Summer decorated her house with pink and yellow ribbons, hoping to welcome her home before durring the holiday season. 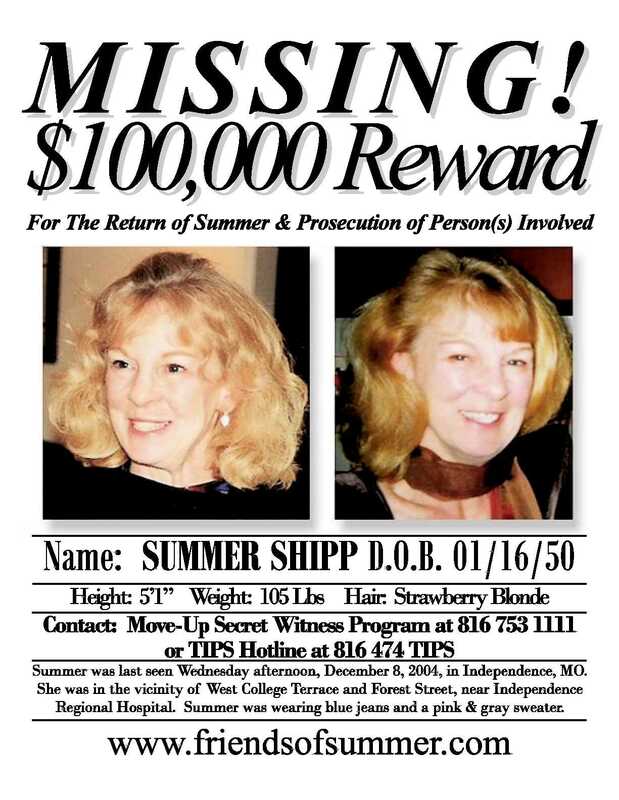 At the press conference, Shipp’s family announced an increase in the reward offered for her return. The reward stood at $35,000. Brandy Shipp stated the amount was increased to $50,000 in hopes that it will bring forward anyone who has seen her mother since her dissapearance. Two billboards and five Metro buses and 30 taxi-cab tops have been volunteered to display this picture in helping to find Summer Shipp. The billboards are located on Southbound I-35 just before the 27th & Broadway exit and on I-435 near the Truman Road Exit. Shipp’s family and friends held a candilight vigil on in Independence, Missouri, at the site where her car was found. Summer Shipp was last seen Wednesday, Dec. 8 leaving the midtown area. Her bronze BMW was found last week in Independence, where she had gone to do door-to-door canvassing for her market research job. The vigil was held at 5 p.m. in the 1500 block of West College Terrace between Forest and Fuller, three blocks north of Independence Regional Hospital. Move Up President Alvin Brooks and other Kansas City and Independence officials attended, as did Shipp’s many family members and friends. Local musicians held a fundraiser for the Summer reward fund. The benefit began at 2:30 p.m. Mama Ray and other musicians performed. Contributions went the reward fund.